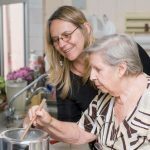 The Journal of Clinical Nursing reported that as many as one in six people who live by themselves at under-nourished or at risk of malnutrition. The 75-year-old group was followed for 4 years. In the 3rd year, 11 percent were at risk for malnutrition, and in the 4th year, 18 percent were at risk. So the questions are what causes malnutrition, what are the health risks and how can it be prevented? Aim to have small frequent meals each day rather than trying for 3 large ones. Add extra energy and protein sources to main meals such as milk, cheese and butter on vegetables. It is important to have appropriate meal consistency. If there are problems chewing certain foods, choose soft texture foods. Add protein drinks to the mix. Incorporate food preferences into each meal and monitor food intake regularly. When possible, eat with them or even just sit with them while they eat and allow them plenty of time.